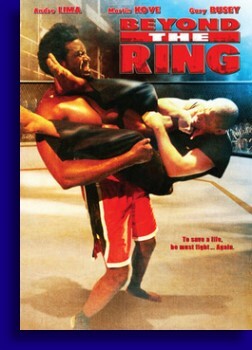 Lame fight movies seem to be the order of the day for this day in my life as I watched the terminable ‘Blood of a Champion’ after watching this flick ‘Beyond the Ring’, and though ‘Beyond the Ring’ is a better flick than that one, you probably have better home movies of your kids that are better than ‘Blood of a Champion’. Brazilian Martial arts star Andre Lima plays, well, Andre Lima who in this movie is a hard working dojo owner literally beating the hell out of a couple of his students as this film opens. Note to self; don’t sign up for Mr. Lima’s classes. Things seem to be going well for the widowed kickboxer as he has a teenaged son in Joesph (Joseph Nerlinger) who admires his father greatly and a spry little girl in Jessica (Aycka Lima) who is just full of all kinds of love and joy. Andre is also a budding publisher with a brand new self defense book about to be released through his agent Tony (Gary Busey). So life is pretty dang good for Andre, but there does seem to an issue with his brother-in-law Patrick (Marty Cove), and what that issue is we aren’t really told, but the two men apparently can’t stand each other and only tolerate each other for the sake of the kids. surgery, and though Tony seems to be living swell to me, he cries broke and tells my man to put his faith in the Lord. However Tony’s sultry assistant Veronica (Jennifer Chu), who walks around the office in camisoles, thinks that Andre may still have some fight in him and will be perfect for their little illegal underground fighting ring. Considering his crappy health insurance plan, Andre is down and hires a trainer in the sneaky Derrick (Brye Cooper) to get him ready for his big fight against the humongous and brutal Zulu (Justice Smith). Oh but there is some shenanigans going on here with that duplicitous Tony trying to run some Oke-Doke on my man Andre. All he wants to do is save his baby girl though, and he will do whatever he can to see this through. Even though ‘Beyond the Ring’ is a brand new movie, it has a real early eighties ‘Gymkata’ low budget feel to it like those Michael Dudikoff movies from back in the day, and though nostalgia can be a good thing at times, I don’t know of anybody who is having a nostalgic inkling towards ‘Gymkata’, though in ‘Beyond the Ring’s defense, it’s not a putrid as ‘Gymkata’ was. It did have a lot of those bad pop music training montages that used to show up in those films back then though. Probably the number one issue with this movie is that Andre Lima isn’t much of an actor. He’s stiff as a board, his command of the English language is suspect which sure doesn’t help his ability to deliver lines and unfortunately he doesn’t give his fellow thespians much to work with. Martin Kove, who is a fairly solid B movie actor was trying to carry Mr. Lima in their scenes, but to no avail and my man Buddy Holly was just in this thing cashing his check. Another thing that hurt the less accomplished actors is that British actor Bryce Cooper is a really good actor. When he show up on the screen for just five seconds delivering his lines your like ‘Oh, so that’s what halfway decent line is supposed to sound like’. Even Andre Lima couldn’t bring him down. The fighting scenes weren’t all that great either, with the exception of the final scene against Zulu which was pretty decent, though even it had some questionable edits with director Gerson Sanginitto getting a little happy playing with Final Cut Pro’s time mapping features. Now far be it for me to tell a film that’s already not too terribly original to be even less original, but the best part about this movie was Justice Smith as Zulu. This brother is 6’8" and 300 pounds of solid muscle. He’s scary big. He also looks like he has a little charisma to him so it’s a shame we didn’t get to see this dude until like the final fight scene (The ending was a little weird in this thing too). But I would have completely went Rocky III style with this movie and given Justice Smith equal time and focus more on him than on Gary Busey and his hot assistant. This would have given the film a nice build up to the final fight, which it was completely lacking, and Smith would have given then film a legitimate villain and also would have given the film a much needed injection of adrenaline as most of this movie was fairly plodding. It’s a toss-up what the hardest kind of movie is to craft. A comedy or a fight film? We’ll stick with comedy since the Chinese can sleepwalk their way to a halfway decent fight film, and ‘Beyond The Ring’ doesn’t qualify in any way shape or form, as halfway decent.